Popular size gable roof garden shed with wide (980mm) single hinged door on the 2.1m side which makes it ideal for deep but narrow spaces. This medium size storage unit is big enough to hide all your stuff away, such as your mower, gardening gear, camping and painting gear. 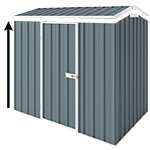 The zinc YardSaver G68 unit is a competitively priced steel garden shed that is very popular for narrow but deep places. This medium size storage unit is can hide all your stuff away, such as your mower, gardening gear, camping and painting gear. You will be surprised how much you can store in it. Storage unit is supplied with step by step assembly guide illustrated with pictures to make the installation a fun and easy project.